* I received the following products in exchange for my honest review by KBShimmer. 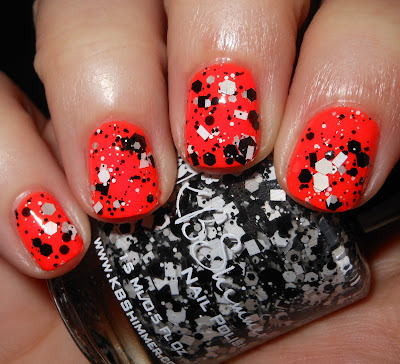 I have 3 of the KBShimmer 2013 summer polishes to share with you today. I voted KBShimmer as my favorite indie brand of 2013 (so did many of you), and as of now KBShimmer is my front runner indie for 2013 too! The creativity of colors, shimmers, and mixes of glitters by KBShimmer always impresses me. I have yet to be let down. I think you all will find these next 3 colors pretty awesome too! 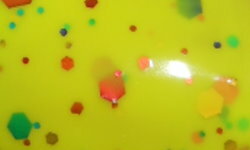 Blinded by the Bright is a neon yellow crelly with rainbow glitters mixed in. 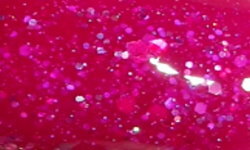 It's Razz-ical is a red-toned violet jelly mixed with pink, silver, and holographic magenta glitters. Grayscale over Color Club Wham! Pow! 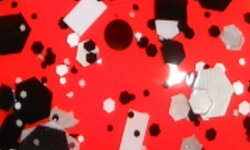 Grayscale is a mixture of black, white, and gray glitters in different sizes and shapes in a clear base. Color: These colors are awesome. This is exactly the types of colors I am wanting in summer. I want loud, vibrant, and in your face colors. KBShimmer knocks it out of the park with these. Blinded by the Bright is a great highlighter yellow with glitter. 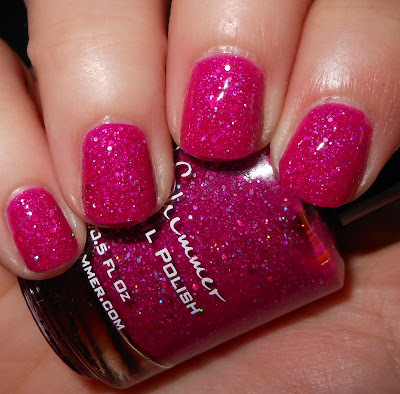 It's Razz-ical is very flattering shade of pink that pops with the glitter. Grayscale is not your typical black and white glitter mix, it's bolder and louder! Formula: Excellent formulas on all of these. Blinded by the Bright might have you worried because it's neon and yellow. Fear not, this was a 3 coater, self leveling, and easy breezy to apply. I used 3 coats of It's-Razz-ical and 2 coats of Grayscale over the base. Price: These can be purchased on the KBShimmer website for $8.75 each. Overall: Awesome 5 star and A+ polishes. KBShimmer has the indie nail polish thing down pat. These are awesome. I recommend you check some of these out. I don't think you'll be disappointed. Be sure to check out the rest of the KBShimmer Summer 2013 collection on their website and follow KBShimmer on Facebook! *I received the above products in exchange for my honest review by KBShimmer. These are gorgeous. It's Razz-ical is my favorite. I really love, It's Razz-ical! That's definitely going on my wish list now. Thanks! It's Razzi-ical is gorgeous! Awesome! I hope you can get it soon. Woah, the combo with grayscale <3 that's just awesome! Farewell Google Reader! Follow Me on Bloglovin'!